Whether you need DJ Speakers for your home DJ set up or you need to cater for a larger number of people we have a great range of DJ monitors and PA systems to suit your needs and budget. 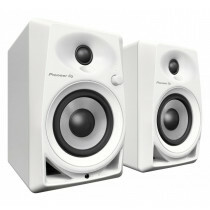 We have speakers that are perfect for use on a small bookshelf or at home in your studio, whether you're after speakers solely for DJ mixing or perhaps you'd like to use them as studio monitors as well we've a range of 3,4,5,6,7 and 8 inch dj speakers and if you need them stands and cables to get your set up just right. With models available from KRK, Pioneer DJ, Adam, Focal and more you're sure to find monitoring to suit your needs. Adam Audio's T Series delivers a professional monitoring solution for those on a tight budget. The Adam T5V is the smallest speaker in the range. The KRK Rokit 6 studio monitor is the 3rd generation of a classic speaker used by producers over the world.